Although TPO is a vinyl type of material, we will also include it as part of this article. EPDM Rubber Membrane roofs are the most popular of all the membranes. However, their popularity does not mean it’s the best type of roofing membrane, but rather the easiest to install requiring very few hand tools and little experience. EPDM Rubber has been around since the 60’s, but it has gone through many revisions due to the adhesive failures that glue the seams together. Because EPDM is naturally black, it absorbs heat and makes the contact adhesives fail prematurely. Watch the video where we found Ultraviolet Rays damaged an EPDM Rubber Roof material. When getting quotes or Roofing Estimates from Roofing Contractors you should be aware of the following. All Roofing Contractors are biased. They will promote the roofing material they are most familiar with and where they can make the most profit. Most Roofing Contractors will try to sell an EPDM Rubber Membrane. This roofing material is the least quality of all roofing systems but the easiest to install. All Roofing Contractors are not equal. The majority of them are familiar with asphalt shingles and do not have much experience in flat roof materials. A Two-Ply Modified Bitumen Torch Down Rubber Roof with embedded ceramic granules is the best roofing system on the market. Very few roofing contractors are familiar with the installation of this roofing system. All roofing materials are not equal – EPDM Rubber comes in different thicknesses. 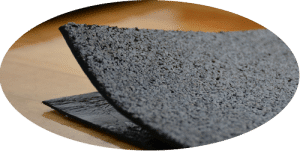 Modified Bitumen Rubber comes in different quality with or without granules. EPDM is the choice of Rubber Membrane Roofing material by Roofing Contractors, but not the best! This next video is showing how hard it is to detect a leak on an EPDM Rubber Membrane. 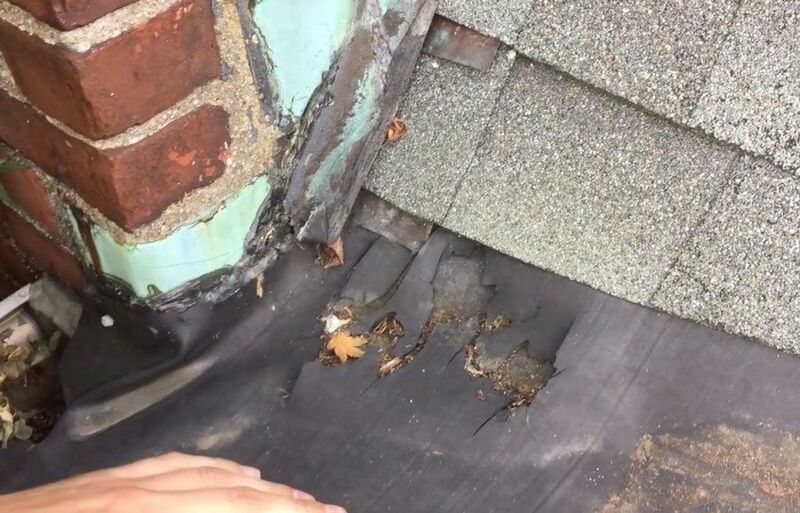 These type of roofing systems are installed all over the United States and little does a potential buyer knows about its longevity and maintenance problems. Our Associated Roofing Contractors in Longview, TX, refuses to install EPDM Rubber Roof Systems any longer. We in the North East have seen the degradation of EPDM over the 30 years and always have steered away for it. EPDM Rubber is a thin rubber membrane and is susceptible to punctures from foot traffic as soon as 3 – 5 years of installation. EPDM seams start to fail due to the glue breakdown that bond the seams together. Most Roofing Contractors prefer to install EPDM Rubber because it’s relatively easy to install and looks and feels good to walk on. The material most Roofing Contractors are familiar with for Flat Roofs, is EPDM. There are obvious reasons why. It’s easier to install. A good sales pitch is “there are “less seems” on the roof because they come in wider rolls. Seams are a problem with EPDM but not so with Modified Bitumen Membrane or TPO. EPDMseams are glued together with contact cement. This technique has a lot of variables that could influence the outcome of the seems. Temperature – Can not be too cold or too hot to apply the glue. Humidity – to much could make the glue not stick to well. Time – When you apply the glue or Contact cement to both surfaces, you have to wait for it to set, touch dry before you stick the two surfaces together. That waiting time is what starts the problem. Where you started to apply the adhesive and where you ended has a time difference. Therefore the adhesive will set at one end before it sets at the other end. Not equally smeared – when you brush the contact cement on, it is impossible to be consistent with the amount you apply everywhere. Preparation – The surfaces should be well cleaned with a chemical – and wiped off. Not very predictable. Primer – some use primer and some don’t. There are too many variables and inconsistencies just with the installation of EPDM that it is almost impossible to have a long-lasting roof without problems. After repairing so many EPDM roofs, we can say with high accuracy that it’s not the best solution for a Flat Roof. Any EPDM Rubber Roof Materials that has been installed over 5 years will have numerous patches. The patches are an indication of EPDM Rubber not being suitable for a commercial roof application. Ultraviolets are the number one enemy for any roofing product. Roofing material that is exposed to ultraviolet will degrade faster than those that are not. Modified Bitumen Materials come with ceramic granules embedded for protection. Watch the video where we demonstrate how we installed a Two-Ply Rubber Membrane Roof over a tar and gravel roof. This is the Best Roofing Material for any roof. 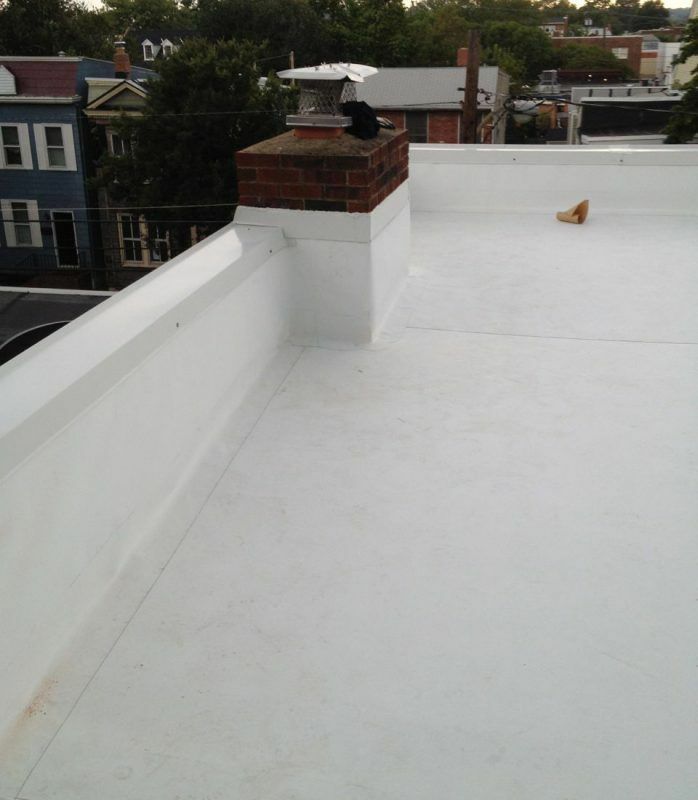 We have installed rubber membrane roofs for over 30 years, and with this technique, we can save an owner money. This type of roofing system is durable and can handle any foot traffic. 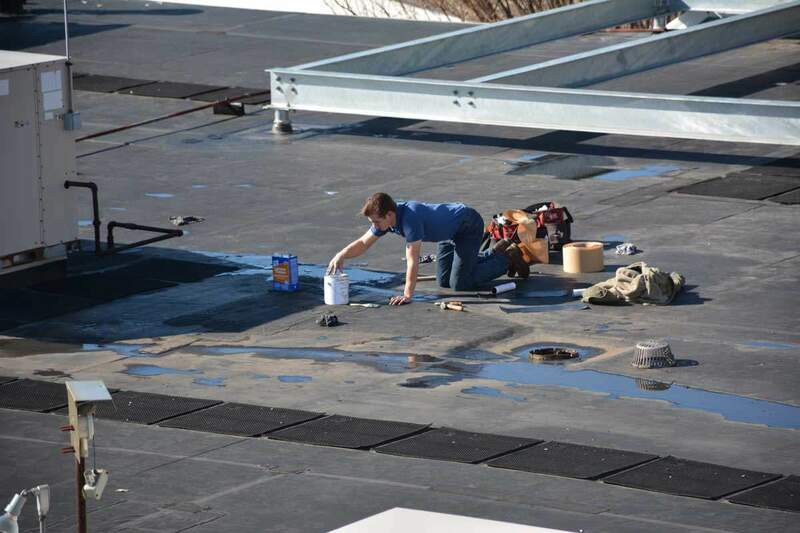 The 2-ply Torch Down Rubber roof membrane can install over any surface, including a gravel roof, eliminating the need to remove the old roofing that intern will save a lot of money. The pros and cons of Modified Bitumen Membrane Roof materials. The appearance is not as smooth and clean as EPDM or TPO. The Torch Down Rubber membrane can be installed almost over any surface without much preparation. Unlike EPDM or TPO. Seams are heat welded, and that makes for better adhesion. Existing flashing that’s already in place eg.where the roof meets siding or skylights, drip-edges, chimneys can be easy reused by just cleaning the old material off. No need to replace it. Unlike EPDM or TPO. Can almost be installed under any working condition – 30 degrees F to 110 degrees F. Sunny day or humid day. Unskilled people can do repairs. (using Tar bought at local supply. The Tear factor – Very unlikely to get damaged by traffic or people working. It’s a thicker and tougher rubber membrane than EPDM or TPO. Modified Bitumen is a petroleum-based material, therefore can be directly installed over existing tar roofs or other Modified Bitumen Roofs. A double layer of Modified Bitumen Membrane fused together will last almost indefinite. Unlike TPO or EPDM. Due to inexperience, many roofing contractors avoid this system. This type of membrane is also heat welded at the seams which make for a secure bond. The TPO membranes reliability has improved in the last ten years. TPO roof seams and the transitions to flashing are better than EPDM due to heat welding as to glue down for EPDM. Much cooler roof than EPDM. Appearance – clean and smooth. Prone to tears due to maintenance traffic. Shrinks a lot and cause edges to pull up. 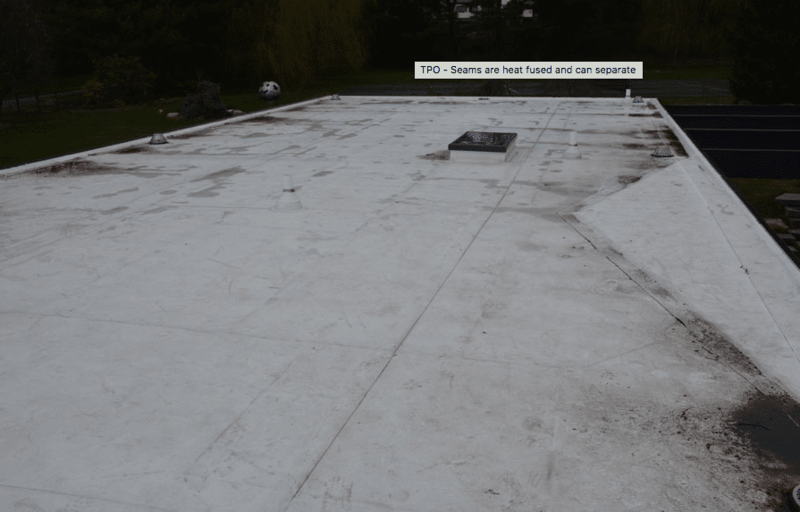 TPO is not a Rubber membrane roof. Although TPO is not considered a rubber membrane roof, it is still a single ply roofing system that is familiar with some roofing contractors. The reason why all these rubber membrane roofs are so popular is that they are single layer roofing membranes that make it easy to install compared to the old Tar and Gravel roofs of the old days. 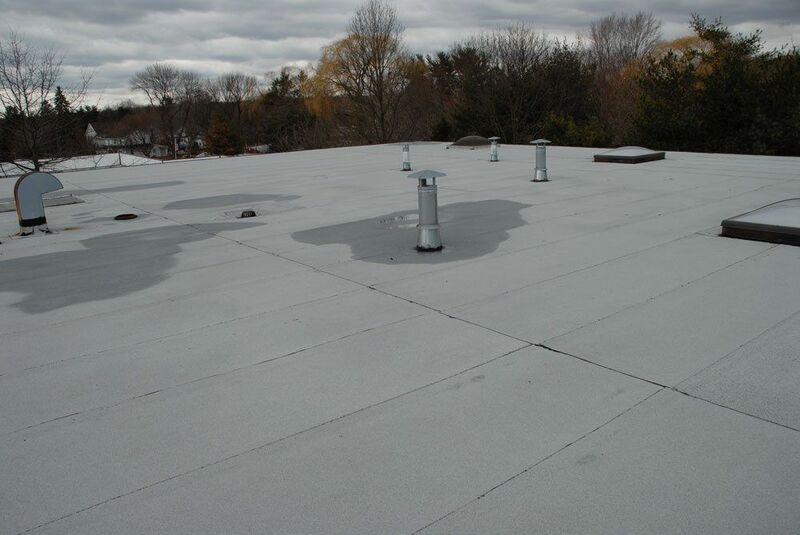 A TPO Roof Membrane installed looks and feels smooth and is a durable roof. The seams are heat welded which makes it much better than that of an EPDM Rubber Membrane which glues together. Welded seams are almost impossible to separate. The issue with TPO is that of weather conditions. Temperatures and humidity can effect the heat welder that needs calibrating to the current situation of the day. A cold or misty day and it becomes difficult to install a TPO Roofing System. 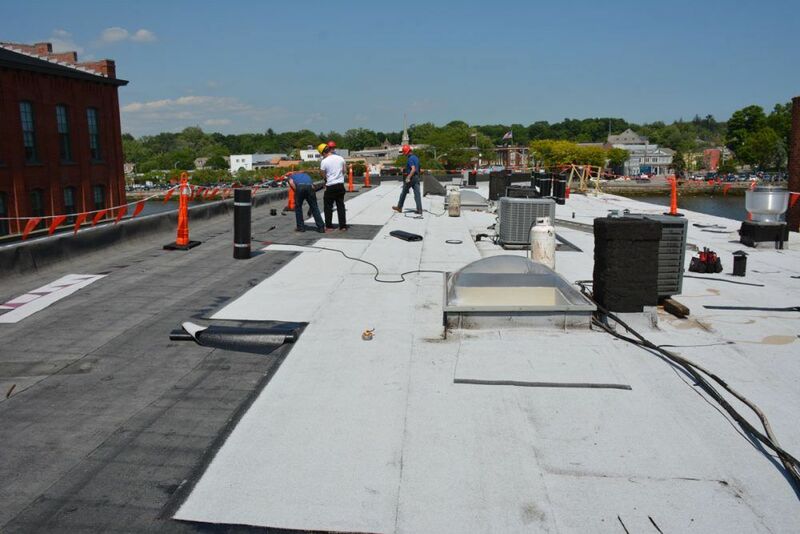 Of the two single-ply rubber membrane roof systems, EPDM and TPO, TPO is by far the best. It reflects UV’s and therefore is a much cooler rubber membrane roof due to the white surface, and the seams will not separate due to the welding process instead of the gluing process. When compared to a single plyTorch Down Rubber membrane roof system, then they are equally good. Adding a second layer of Modified Bitumen rubber membrane to the Torch Down Roof, then there is no comparison.